STIMS Institute – Science Based Technology, Innovation and Management Solutions. Our goal: Create new capabilities for our clients in their work force skills and industrial outcomes (products, processes, business models, education, etc.) to achieve high ROI in innovation investments and true organic growth. STIMS Institute is your knowledge integration resource to achieve these results. Contact us. 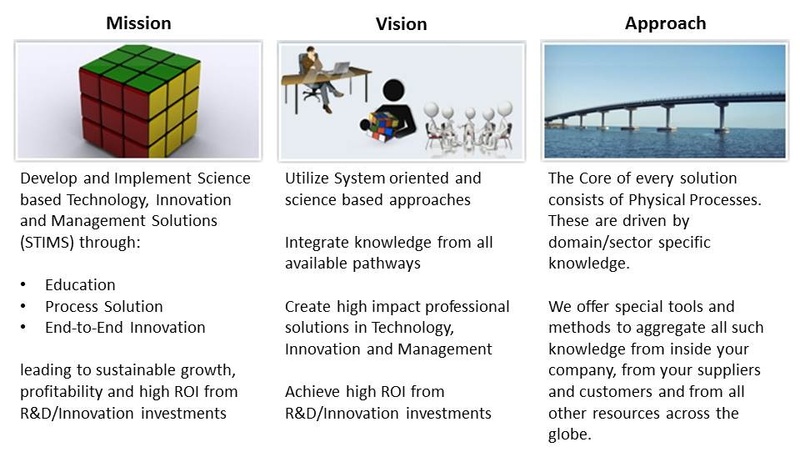 Knowledge from technical resources from across the globe can be aggregated to develop and implement “New Solutions”. We specifically target the knowledge and the science base for a variety of industrial and manufacturing processes. STIMS Institute is dedicated to managing such knowledge from all resources and integrating them to create new solutions. Our goal is to create new capabilities for our clients that offer step change in productivity and alliances for true organic growth. Achieving high ROI in innovation investments for our clients is our deliverable. STIMS Institute is your knowledge management resource to achieve these results. Find out what the STIMS Institute is doing today here.